Do you want to advertise to your existing customers? LinkedIn, Facebook, Pinterest, and Twitter all let you deliver ads to your actual customers. In this article, you’ll discover how you can use four popular social networks to reach custom audiences with your content. 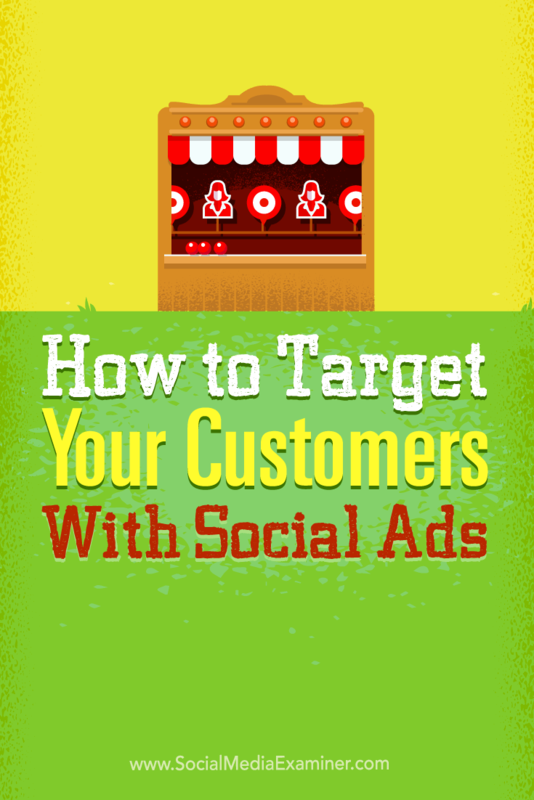 Discover how to target your customers with social ads. Thanks to recent improvements to LinkedIn’s advertising platform, you can now upload a list of up to 30,000 companies. LinkedIn will automatically target ads to those companies’ employees. You can choose these 30,000 companies from among the over 8 million LinkedIn company pages. 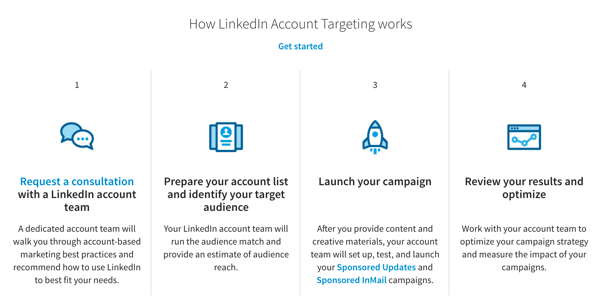 LinkedIn’s audience match platform launched a few months ago, with account targeting as the first rollout. At this time, audience match targeting on LinkedIn is not yet fully self-service; you’ll need to register for a consultation with an account rep first. The onboarding process for LinkedIn audience match ads. Once you’re approved, you’re golden. The feature works similarly to the custom and tailored audience features on Pinterest, Facebook, and Twitter, but with a decidedly B2B twist. To really unlock the power of audience matches on LinkedIn, you’ll want to combine these target parameters with additional ones like age, geographic location, job seniority, job title, and gender. Remember that not all of your email subscribers will have a LinkedIn account, and just because they have one doesn’t mean they’re actively using it. Pinterest launched promoted pins in 2013, but it wasn’t until recently that the network dramatically improved their targeting options. In addition to keyword and interest targeting, you can now use customer list targeting. Pinterest will let you upload your customer email list to its ads platform as a comma separated value (CSV) file. 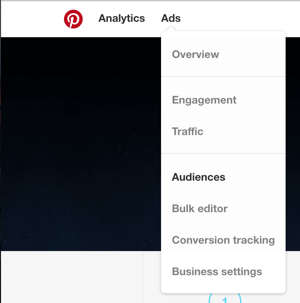 To get started, go to the Pinterest Ads Manager, click Ads, and then Audiences. Select Audiences from the Ads drop-down menu. Next, click Create Audience. Then in the pop-up box, select the option for A List of Customers That You Upload. Select the option to upload your customer list. Now enter a name and description for your customer list audience. Then click Choose File to upload your customer list. Click Choose File to upload your customer list. After you click Create Audience, Pinterest’s ad engine will attempt to match your list of email addresses to active accounts. Keep in mind that not everyone on your list will have a Pinterest account. Also, due to privacy concerns, Pinterest will only let you target an audience list of 100 people or more. Once Pinterest finishes matching your list of email addresses, you can use this custom audience when you set up your Pinterest ad campaigns. Note: Pinterest recently added visitor retargeting and lookalike targeting to its native platform. This lets you reach people who have visited your website but haven’t signed up for your email list. You can also reach people whose Pinterest habits resemble those who have already subscribed to your list. All Twitter ad campaigns start with the basic keywords, interests, and followers targeting options. However, the platform also has a tailored audience tool, which allows you to target people based on their previous engagement with your content or website. To use this feature, you’ll need a Twitter Ads account. 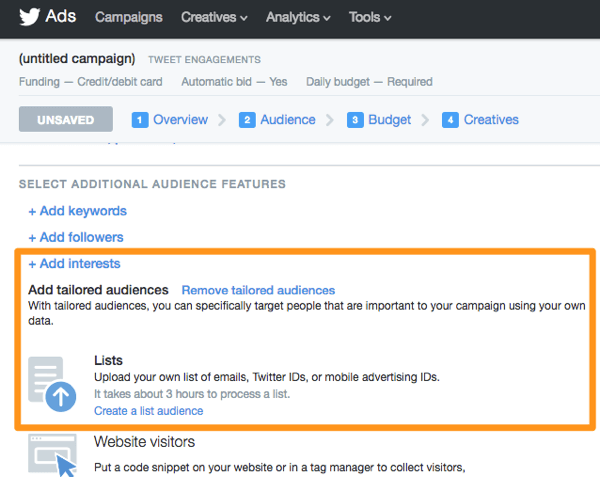 Head to your Twitter Ads dashboard and select Audience Manager from the Tools menu. Next, click on Create New Audience and select Upload Your Own List. 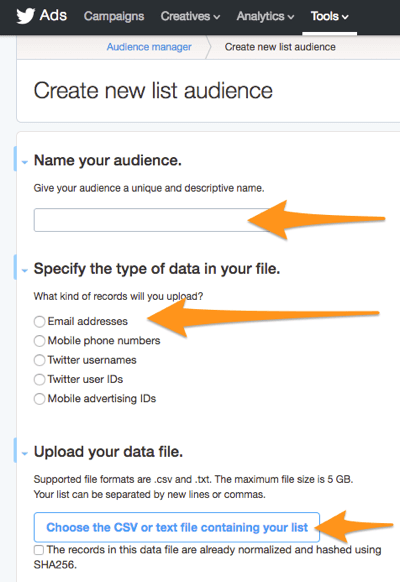 Fill in details about your new list audience in Twitter Ads. 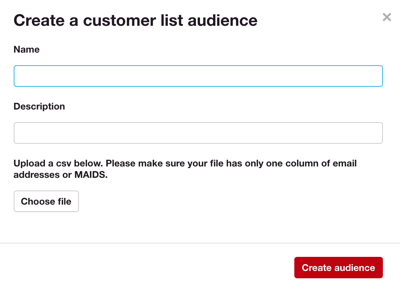 Give your audience a name, select the Email Addresses option, and upload your CSV file. Once Twitter finishes matching profiles with your list of email addresses, your tailored audience is ready for you to use in your campaigns. When you’re creating your ad, go to the Select Additional Audience Features section, choose Add Tailored Audiences, and enter the name you gave to the list. Target your list audience in a Twitter ad campaign. Run a promoted accounts campaign to increase your follower count. Find subscribers who are already using Twitter (to make sure you’re connecting with them there, too). Deliver targeted messages to segments with promoted tweets. Promoted tweets appear at the top of relevant search pages, within search results, and inside user feeds. You can choose to manually or automatically add the tweets you want to promote. The automatic route allows Twitter to choose up to five of your most engaging tweets. 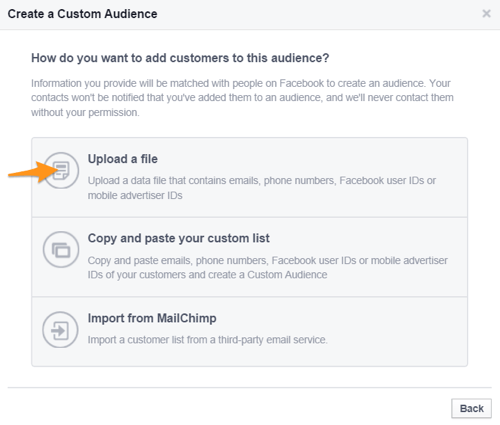 Facebook’s Custom Audiences ad feature lets you upload your email lists and create saved audiences for ad campaigns. This type of ad targeting (in combination with others) lets you retarget people, remind them about emailed offers, promote sales, or run exclusive sales for people who are subscribed to your email but not fans of your Facebook page. To create a custom audience, go to your Facebook Ads Manager and click on the Create Campaign button. Choose an objective (other than Reach People Near Your Business). In the Audience box, click on the Create New tab and make sure to uncheck the Prefill with options from your last ad set box. Now, click on the Create New dropdown menu under the Custom Audiences box and choose Custom Audience. In the box that opens, select Customer List and then Upload a File. Click the option to upload your customer list as a file. Next, select your TXT or CSV file, add a name and description to your custom audience, and you’re good to go. 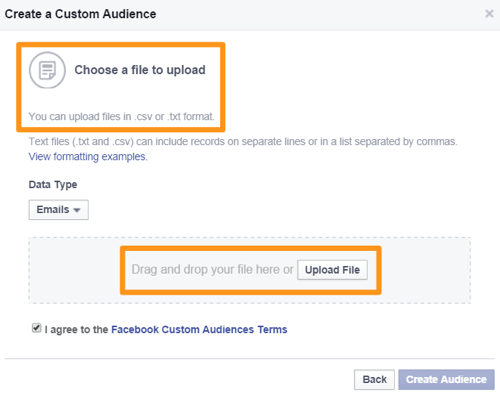 Choose the file you want to upload to create your custom audience. One great use of custom audience ads is to encourage email subscribers to like your page. Although many subscribers may already be your fans, there are likely some who have not engaged with you on social media. You can also use your email list to create a lookalike audience, which helps you find people who are similar to your email subscribers. This way, you can grow your email list to include more qualified prospects. The people who want to build relationships with your business via email are more likely to pay attention to you on social channels than people who don’t know you. So if you’ve already captured your leads’ email addresses, you can use your email list to target those same people on social media. Increase page likes and followers. More fans and followers help you improve your reach, leading to more opportunities for sales and engagement. 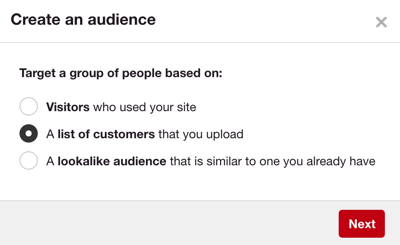 Target users similar to your subscribers. Your subscribers represent the people who are most likely to buy from you, so of course you want more people like them. In this sense, promoting your social posts to email subscribers is like an organic version of Facebook lookalike audiences. Extend your post reach. The number of people who see your content organically is a small percentage of your total audience. You can use ads to get your content in front of more eyes. Cross-channel engagement keeps things fresh. Move more product. Subscribers and fans are more likely to make purchases than non-fans or non-targeted groups of customers. Did people you’re tracking recently visit a page that implies intent to buy (product pages, terms of service pages, etc. ), but they haven’t converted yet? Retargeting them via paid social can be highly effective. Your email list audience is preselected to be more likely to comment and share your messages on social media. This type of engagement can help your social posts get in front of new prospects. The ability to serve ads to your email subscribers on social media is a customer acquisition and retention marketer’s dream. With these customized audience social advertising tools, you can make your email list do double the work for you simultaneously. First, by reaching subscribers with highly targeted messaging; and second, by finding new prospects. What do you think? 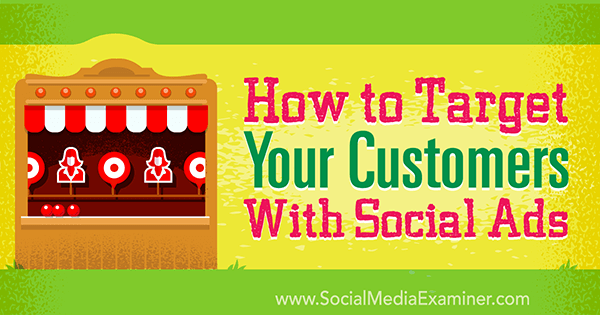 Have you created custom audiences of email subscribers on your social channels? And if so, how have you used them? Please share your thoughts in the comments below! Tips on how you can use social network ads to reach custom audiences. Ben oversees new media marketing at Action Packed Media, a boutique managed service agency based in Israel. Action Packed Media also offer subscription-based email marketing solutions via ManagedForMimi.com.